This PDF 1.7 document has been generated by Microsoft® Word for Office 365, and has been sent on pdf-archive.com on 23/10/2018 at 20:24, from IP address 86.15.x.x. The current document download page has been viewed 89 times. encouraged to choose that part of the curriculum that suits their interest. specialities and become the preferred choice of learners. 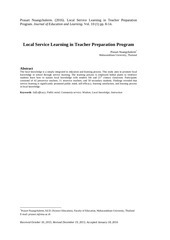 There are various methods governments can use to segment learning for students. A set of learners sharing common needs, wants &amp; expectations that’s schools tries to teach to. In present schooling there is one dominant (mass) Curriculum says tuition in Bradford. what children should learn and by which age. governments educational unit costs are lower (economies of scale). What is your thought on learning online? This file has been shared by a user of PDF Archive. Document ID: 01899826.